Marco Rubio for President! What’s not to like? A guy who comes from a working class family. He knows the meaning of “have not” and earning everything he has achieved. Marco Rubio is living the “American Dream” and need not apologize for it. 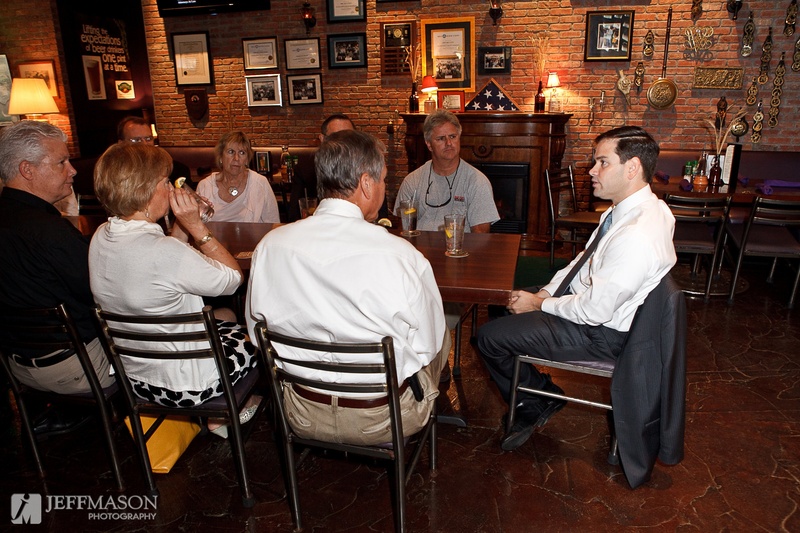 Several small business owners had the opportunity to meet Marco Rubio and we were not disappointed. 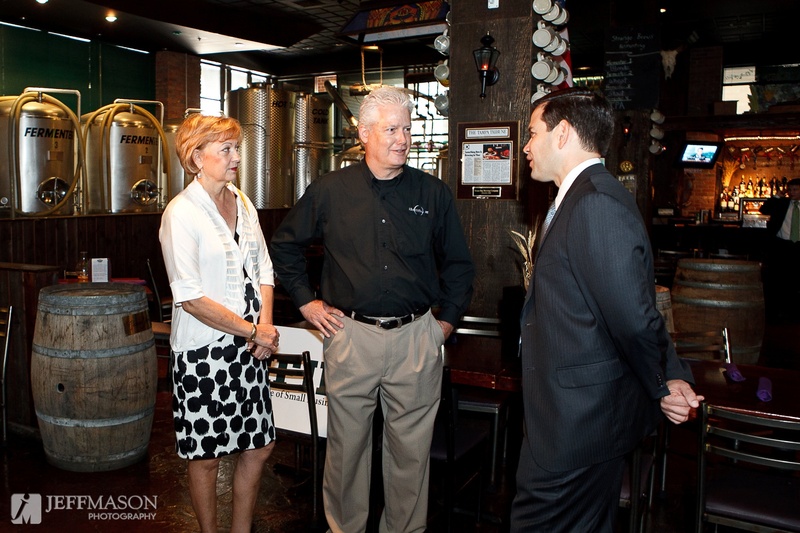 The National Federation Independent Business (NFIB) invited us to the Tampa Bay Brewing Company who hosted the announcement by NFIB Florida of their endorsement of Mr. Rubio for the US Senate. Mr. Rubio spent several hours with a group of local Tampa Bay area small business owners and NFIB members. Several small businesses were fortunate to spend time with him introducing their companies and the challenges they face in today’s economy. No doubt we are talking about the next US Senator to represent. Florida. Now Mr. Rubio, how about that payroll tax holiday for small businesses and their employees? Make no mistake about it, Lance Armstrong is no Mother Teresa! If Lance is guilty of doping, what should we do? Take away his bike? My message is less about Lance, the man and more about Lance, the messenger. I am sure you have heard the expression, “Don’t shoot the messenger!” Regardless of how you feel or think about the man, the message is clear, “Livestrong Anyway”. Recently my sister Kay was diagnosed with breast cancer. Thank God, she will survive, albeit after suffering surgery, chemo and radiation therapy. For Kay, amongst many untold stories, there is a long hard road ahead. Our family, myself included, has always been an advocate for the fight to cure cancer. We have friends and family members fighting Alzheimer’s, heart disease, cancer and MS. We are no strangers to the challenges life imposes upon all of us. I maintain a good fiction writer could tell a story as good as the story Landis has told about allegations Armstrong was doping (In 2006 Floyd Landis was stripped of his title after testing positive for synthetic testosterone). Landis knew all the ins and outs of doping and he wasn’t the only malcontent that had hung out with Armstrong, so the courts will need plenty of corroboration from cyclists who either were complicit or witnessed the doping. As soon as Landis came out with his story Armstrong should have sued him instead of dismissing him as a loser. There’s too much at stake. For my part, there are lots of questions. How many of us could have endured Armstrong’s road to a cure from a tumor that had metastasized to his brain and lungs? How many of us could have endured the challenges of winning seven 7 consecutive Tour de France races, typically 21 days of racing and covers 3,200 kilometres (2,000 mi) championships? Is he less of a champ if he was cheating or only if he is caught? Could it be said he won fair and square since most likely everyone was cheating? In 1998 the race stopped in protest at what the riders saw as heavy-handed investigation of drug-taking allegations. In 1998 the Festina team was disqualified after revelations of organized doping within the team. In 2006 Floyd Landis was stripped of his title after testing positive for synthetic testosterone. In 2007 Michael Rasmussen was removed by his team while wearing the yellow jersey for lying about his whereabouts during a team training session in Mexico. In 2010, Alberto Contador, the three-time Tour de France champion was provisionally suspended by the international cycling federation after a small amount of the banned drug clenbuterol was discovered in one of his samples by a laboratory in Cologne, Germany. My message is Livestrong Anyway! LIVESTRONG http://www.livestrong.org/ has a life of its own. Many good-hearted folks worry about the consequences of the weighty accusations and bad press about Armstrong which Livestrong and Armstrong must endure. A friend of mine, pictured here below has raised thousands of dollars for Livestrong and for a cure. She recently wrote, “It makes me nervous for Livestrong and the 28 million people living with cancer.” So what happens to an organization built on the courage and determination of one man? The organization is built upon people who are dedicated to the fight against cancer; who have family members with cancer or who are cancer survivors themselves, such as Doug Ulman, President and Chief Executive Officer of Livestrong. Whatever the outcome, what the many volunteers and the organization Livestrong has done for cancer victims cannot be undone, which has all been great. Excellence survives! In any case, I’m a much bigger fan of Mother Teresa. The good you do will be forgotten tomorrow. but may attack you if you help them. and you’ll get kicked in the teeth. 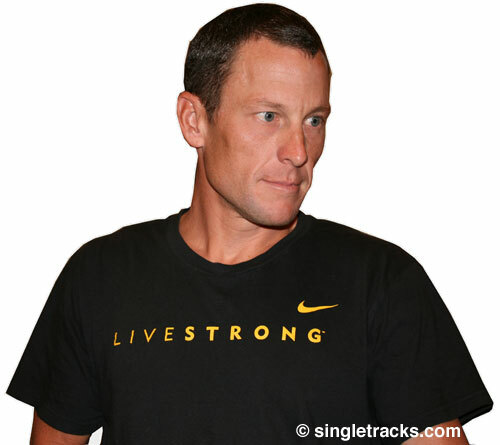 Whatever the outcome, whatever Armstrong has done, what Livestrong has done for cancer victims cannot be undone, which has been all great. Even Mother Teresa had her doubts about her God, so why should we doubt Lance, the supreme being of cycling?